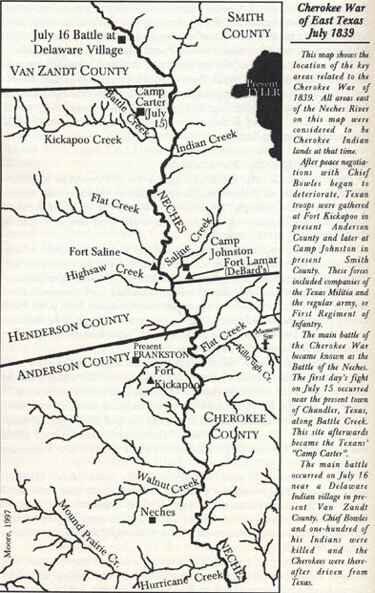 Below are the Historical Markers' text and location for topics related to the Cherokee War. Marker Location: From Canton, take SH 64 about 19 mi. SE to CR 4923, follow signs N about 2.5 mi. to marker. Marker Text: (Site 15 miles southeast) Main engagement of Cherokee War; fought July 15 and 16, 1839, between 800 Indians (Including; Delawares and Shawnees) and 500 troops of the Republic of Texas. An extraordinary fact is that David G. Burnet vice president of the Republic; Albert Sidney Johnston, secretary of war; and two other high officials took active parts in the fighting. When killed, Chief Bowles, aged Cherokee leader, carried a sword given him by Gen. Sam Houston. After the defeat of the tribes, they scattered, thus virtually ending Indian troubles in the settled eastern part of Texas. Dr. William George Washington Jowers tended to the wounded during both the Kickapoo War and the Cherokee War. Later a Texas statesman and a judge, Jowers was among the negotiating party sent to Chief Bowles' village for peace talks during the Cherokee War. John Henninger Reagan, another Cherokee negotiator, fought bravely in both subsequent battles. He would later serve as a judge, legislator, and as postmaster general of the Confederacy. Reagan's home in present Anderson County was built on the site of the original Fort Houston. This account of the Cherokee War in East Texas is from the book, Indian Depredations in Texas, by J.W. Wilbarger.